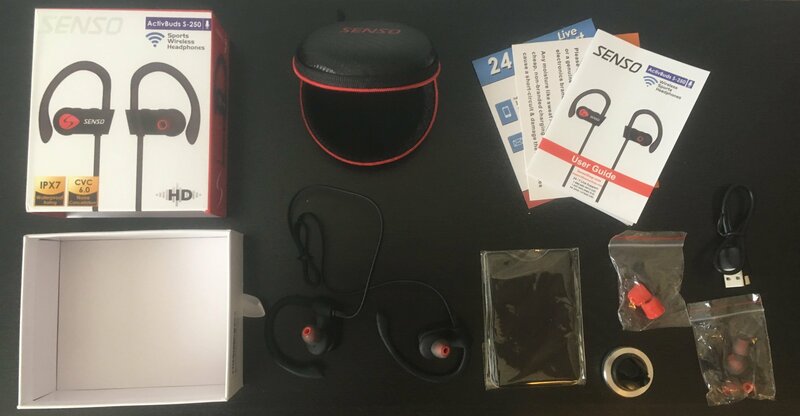 The S-250 is an inexpensive and currently popular wireless pair of earbuds that’s actually full immersion IPX7 certified waterproof. They’re merely connected to eachother and there’s no 3.5mm jack, so these are only usable via Bluetooth. The packaging was nice – once the sealing plastic is removed, the hard box has a little ribbon to pull it out from the sleeve, revealing quite a lot of additional goodies inside. The headphones are a bit big and bulky, but still manage to be reasonably light. Even after finding the best replacement tip for me, I wasn’t able to get a completely sealed and secure fit. The ear hooks are actually malleable though, so you can shape them to your ear. Maybe with a bit of effort I could have gotten a better fit. All in all they’re quite comfortable. The controls are on the right headphone and are very basic – two tracking/volume buttons up top, and the “S” logo is also a pair/call/pause/play button. I actually like this set up because it feels easier than fishing for buttons on an in-line mic that’s dangling along the wire. With a now seemingly innumerable number of budget headphone manufacturers, it’s sometimes pretty clear when “different” products/companies are using the same design/manufacturer. 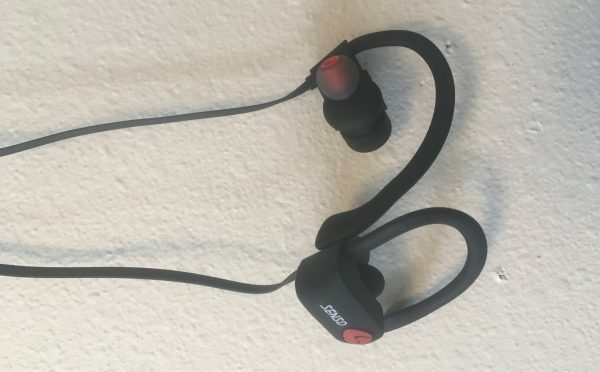 Now, the inside drivers could certainly be different, but I wouldn’t be surprised if these were just the same headphones wearing different clothes. Since these are only usable via Bluetooth they need to be charged first, which took mine about 1.5 hours. The advertised battery life is 8 hours which is comparatively OK.
My initial listening test further confirmed my suspicion that the S250s use the same hardware as MPOW Flames, because they sounded bad in the same way that that the Flames do: very bass heavy, but not in a good way. The bass was grainy and muddy and totally overpowered the mids and trebles which were significantly recessed. Like the Flames, it once again sounded like I was listening to speakers underwater or while squeezing a pillow against my ears. I kind of casually skipped through my testing playlist since I in effect already did this test with the Flames. The S250s might actually sound even worse than the Flames did. 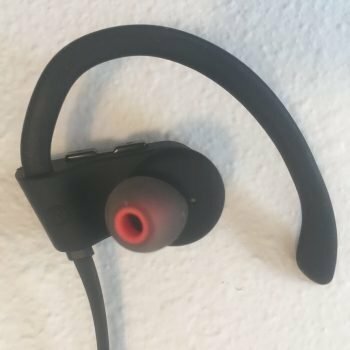 These headphones do get very loud, very easily though, which could be useful for active/commuter or I guess underwater use. Various sales pages have advertised these as noise cancelling headphones but they are not, and rather have mere noise isolation, which I’d say is about a medium level of decent. CVC 6.0 certification helps somewhat with external noise filtration, but not completely. 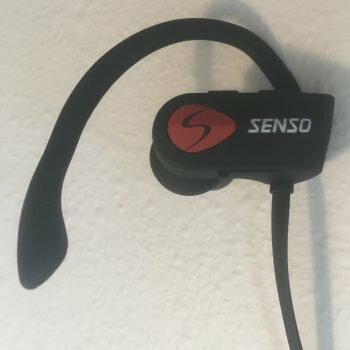 Senso offers a one year warranty on its headphones, which is average coverage at this price-tier. 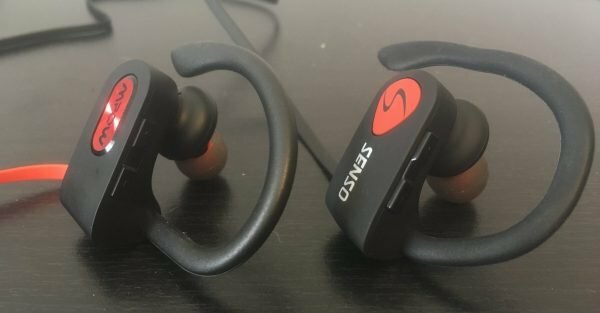 The Senso S-250 is a somewhat bulky but decently looking, fitting, and comfortable earbud that’s also waterproof, all for a relatively inexpensive price. They don’t sound great though. While they get very loud and have strong bass, the bass is grainy, muddy, and bleeds significantly into the mids/trebles which are significantly recessed, resulting in a generally muffled sound that lacks detail and crispness. In a niche that now has a lot of competition, there are similarly priced alternatives that sound much better, especially if you don’t need something that’s fully waterproof.